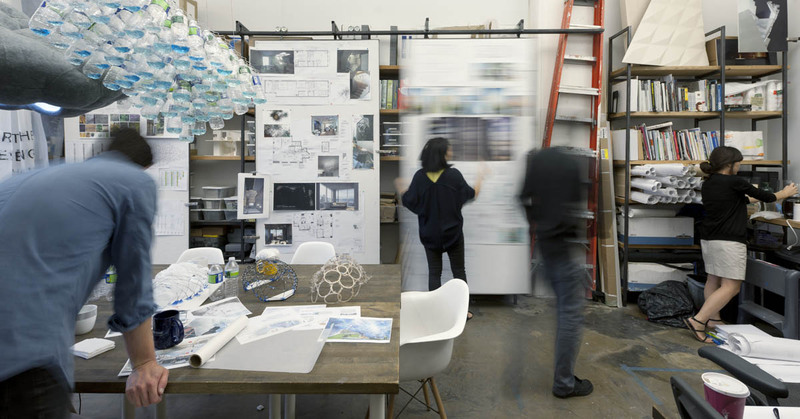 Our studio is a group of architects, builders, designers, engineers, and artists. Because we believe there has to be an understanding between what we design on the computer and what we build, our physical space is half office, half workshop. It's a place where the concept for a project or the decision to select a material can come out of a formal study done in the computer, as it is to come from the physical exploration into a material's properties in the workshop. Our team and our working method allow us to engage in the full range of scale and phases of projects from furniture and lights, to large installations, sculptures, interiors, and buildings.